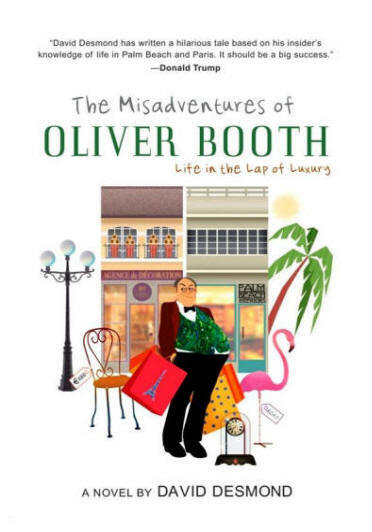 I just finished reading a very enjoyable and funny book entitled The Misadventures of Oliver Booth: Life in the Lap of Luxury by David Desmond. This satirical novel presents a look into the lives of Palm Beach Florida's elite, and a man named Oliver Booth who hopes to get their money from them through his antique shop. Oliver is a grossly overweight, rude and somewhat abusive boor of a man who wears tacky polyester suits. For some reason, thinks he is "all that". Oliver doesn't really sell antiques, but Mexican made reproductions of them he hopes to pass off a genuine French ones, and sell for outrageous markups. He has enjoyed little success ripping off people in this manner, as a pile of unpaid bills on his desk demonstrate. His biggest goal it to get his fat sweaty hands on the money of Margaret Van Buren, an aging widow who is quite possibly the wealthiest person in Palm Beach. Toward this end, he attends a New Year's Eve party at The Morningwood Club, a country club he joined chiefly because she is a member there. His every attempt to get close to Mrs. Van Buren and try to sell her something is thwarted. He ends up falling into a swimming pool after being shoved by an old man who only wanted to show off his trophy wife, not hear a sales pitch. That is only one of many hilarious things that happen to him through the course of this highly amusing novel. I especially liked little details like the club's staff pouring common domestic sparkling wine into empty Dom Pérignon bottles, and serving it to guests who were none the wiser. If I ever try this expensive libation at a party and am not impressed, I will remember this, and suspect that it was not the genuine article. At this New Year's Eve party, readers will also get to meet the most important character of the book, a foil to Oliver named Bernard Dauphin. In spite of the title, some readers may feel the book is really about him. Bernard is a young man from France who has recently arrived in the United States, and taken a part time job as a waiter at Morningwood. He is soon offered a second job at Oliver's shop where he hopes to make some extra money, and Oliver hopes that someone with a French accent will help move the faux merchandise. While in the employ of Mr. Booth, Bernard convinces his employer, who did not want to do it, to purchase one genuine antique at auction, which he later shows to Mrs. Van Buren. She loves, and immediately purchases it. This find leads her to commission a trip to Paris where Bernard will find her things to decorate her guest house, and Oliver, being Bernard's employer, will be along for the ride. Bernard is impeccably honest, and wishes to get Mrs. Van Buren things she will like according to their shared tastes in fine furniture, and at a fair price. Oliver, however, wants to treat himself and take Mrs. Van Buren to the cleaners. I could go on and on about the things that happen in Paris, such as Oliver uttering aloud that he has a dog named Napoleon; a name it is unlawful to call a dog in France. For this offense, Oliver has to borrow money from Bernard to pay his fine. Many other outrageous things happen when they return to Palm Beach, but I will not tell you about them, or how Oliver finally gets his come-uppance. I won't spoil it for you. Get a copy of The Misadventures of Oliver Booth, and read it. You will be glad you did.